They say “An artist is only as good as the tools they use” well this rings true in my case. I have always found that using a good quality brush or sponge when applying makeup helps tremendously boost my game. Add environmentally friendly product innovation to the mix and you’ve got me hook, line and sinker. 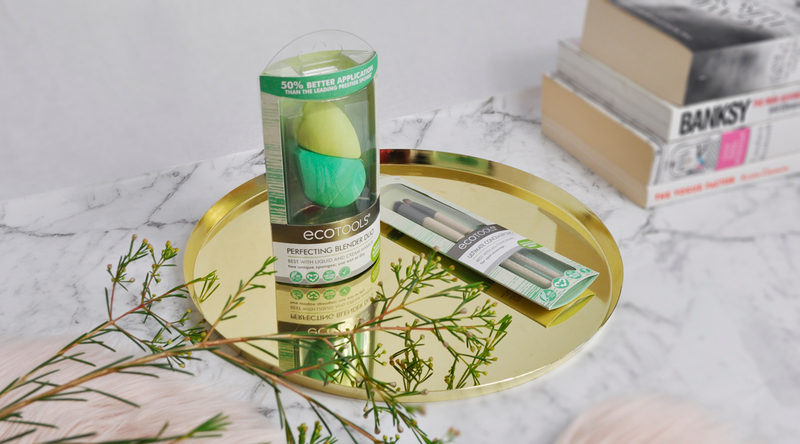 EcoTools have celebrated their 10th anniversary with a huge rebrand to their entire collection. With a bold, fresh and contemporary look, the New Modern Eco Collection features a refreshed logo and modern more responsible packaging with clean colours and modern metallic accents. A special mention has to be given to them for pioneering the first-ever makeup sponge made from plant based materials. Available in two sizes and densities, the Large Base Blender is soft and flexible to create light, buildable makeup application and the Mini Detail Blender is firmer for more precise and detailed coverage. They are designed to perfectly fit the contours of the face and can be used both wet or dry, ideal for liquid or cream makeup. How To: When using it wet, squeeze excess water until damp. Apply makeup in a stippling motion to blend product into skin. These ultra soft brushes deposit the perfect amount of product for an even application. Designed to precisly cover and blend makeup into skin for a smooth flawless finish without loosing your desired coverage. Cover: After applying foundation, use the Detail Concealer to precisely cover spots or discoloration. Blend: With the Airbrush Concealer, blend out color deposit previously applied for a smooth base. 100% vegan and PETA certified, all products continue to be mindful of the earth and use recycled, natural and sustainable materials. The entire collection is comprised of renewable and recyclable materials including tree-free paper, vegetable based inks and RPET clamshell packaging, to help remove materials from the waste stream for a 26% smaller carbon footprint. Each product directly links to a recommended colour cosmetic pairing, showcasing the end benefit, featuring a face chart for application and identifiing the level of coverage. Perfecting Blender Duo Sponges (made from 71% plant-based materials), Micro Blending Brush, Ultimate Concealer Duo, Eye Enhancing Set, Ultimate Shade Duo, Full Powder Brush (designed with a large, incredibly soft, 70,000 bristle brush head offering 200% more bristles than a standard powder brush!) and more! Redesigned makeup brushes, featuring tapered light-weight brush handles still made from renewable bamboo, for improved comfort and performance, in a brighter wood colour, with contemporary gunmetal ferrules and beautiful ombre bristles. I am a long-time eco tools user, but didn’t realize they refreshed their look. I will have to invest in a few!! Thanks for the post. I’ve been curious about these sponges! The shape looks really well thought-out. I will have to keep an eye out for them here. I’ve not seen those brushes – I especially like the look of that duo fibre one for blending. I want to get a few more of their brushes, I’m so impressed. I love EcoTools, the only brushes I use now! I will have to check the new blenders out. Yes! Please let me know what you think when you do. Love supporting eco friendly brands. I’ve been dying to try those sponges! They are so good! Hope you like them too. Ooh love this! 🙂 big fan of eco-friendly makeup products.